Rohan Fernando, the President of Amateur Rowing Association of Sri Lanka (ARASL), officially announced his intention to contest the post of president of the National Olympic Committee. He will contest Suresh Subramaniam at the February 23 election of office bearers in a bid to take control of the country’s premier sports body. 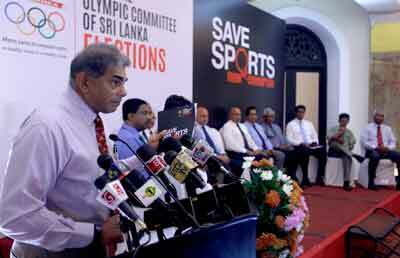 Fernando, alongside a batch of supporting officials from 16 other NOC Member Associations, launched the campaign under the theme ‘Save Sports from Corruption’ while reading out the vision and mission statements at an event held at Hotel Taj Samudra in Colombo on Thursday. “I don’t need to indulge in this kind of activities and also I don’t have the wealth to provide financial aid to these associations. But we are here collectively as a team with one vision, that is to eradicate corruption and misuse of privileges and with hopes of adhering democracy to the system,” said Fernando. Fernando also unveiled his action plan. This includes strengthening corporation between all stakeholders–IOC, Ministry of Sports, Ministry of Education, National Sports Federations and the private and public sector, empowering and facilitating NSF’s, instilling discipline and decorum at the NOC, equitable distribution of resources, capacity building of body and mind, free sports from drug abuse, media coordination, strengthening the spirit of volunteerism, recognising the Olympian Alumni, help better utilisation of the funds available for sports development and encourage compliance based administration. Fernando also revealed that more associations have pledged their support in favour of his team but did not reveal names that will contest for other positions, stating that they will be made public in the near future. “We chose to mind out own businesses by running our respective associations all these while but then again we also thought some day we will be responsible for not acting promptly against those who actually went against the norms of IOC Constitution and the Olympic Charter. Our only intention is to make the NOC a transparent and respectable governing entity,” he added. The NOC elections were postponed on several occasions since 2013 and the previous election was held way back in 2009. Fernando emphasized that he will be contesting the elections with a great deal of confidence and with the backing of some senior top ranked sports administrators. “We would take up any criticism in a sporting manner and would like to build up a good relationship with all stakeholders. But as true sportsmen who value the spirit of true sportsmanship, we are deadly against misconduct and isolation. All of us are stakeholders of sports and the NOC and we are abide by the rule of the land as well as the IOC regulations. Our intention is to make anyone who takes any role responsible for his conducts and open the doors to all sports bodies and athletes, so that a healthy and transparent relationship could be formed to benefit the country through sports,” Fernando explained.